I love handmaking gifts for the holidays. When I was younger, it was often ornaments with my school photo in them. Now, they are more often than not knitted scarves. My first attempts were simple all knit-stitch scarves for my sister, made out of Homespun. 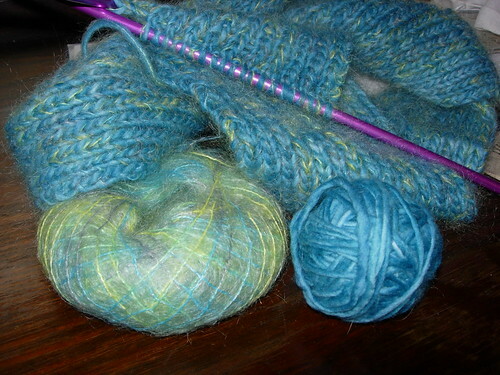 I've graduated to many finer yarns and more difficult patterns. One I enjoy making, and knits up fairly quickly (I am a slow knitter) is from Last Minute Knitted Gifts, and is basically *K1,P1*K1, however wide you want to make it. I have made it with Malabrigo and a coordinating kidsilk/halo-y yarn. The one below is for my friend Steph, and was made for her last year for Christmas. I love the variations in Malabrigo, and with the right coordinating yarn, it looks great!